here’s a link to a great chicken recipe I tried last night. It’s from Giada De Laurentis, of course. I’ve never met a Giada recipe I didn’t like. The only change I made was to use boneless, skinless chicken breasts and the simmer time is 10 minutes instead of 20-30. I’ve made this chicken several times as well. It is SO yummy! 🙂 Giada and Ina Garten are two of my favorites. Julia, Fuzz likes it too. Maybe because it is so colorful and pretty, kids try it and think “Hmmmmm, this is not all bad”. Michelle, I didn’t know the baby had arrived. Thanks for the update! Claire, it seems like something you’d like :). Michelle, Giada really is good at what she does. She’s bridges that gap between professional chefs and home cooks. Her recipes are built for every day cooking but they seem good enough that even a chef would make them at home. Does that make sense? that chicken looks gorgeous – all the colors! it’s like delicious confetti. i’ve never been that into giada, but lately i’ve been seeing dishes of hers on a bunch of blogs and they’ve all been lookin’ good. I love Giada food, I have all her cookbooks….she had her baby girl, you know! Carol, thanks! I fixed the link. 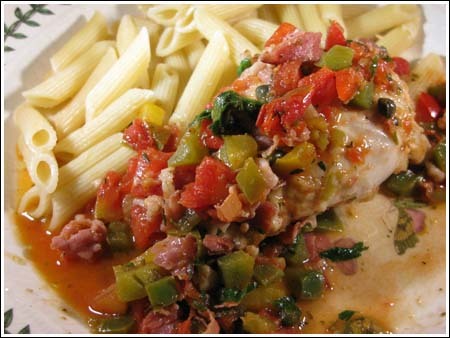 It’s not the same as her chicken stew, but it’s very similar to her chicken cacciatore. This recipe is marvelous! I’ve made it before and not only is it easy, but it’s really good. My two year old really likes the tomato/pepper combo (believe it or not). Hey Anna, both links go to the Almondina page. I want to see which Giada recipe; I love her stuff, too. I have made her Chicken Stew many times and wonder if it’s the same one you are are referencing. If so, cool! and if not, I want to try yours.